Now you can include Internet users as part of your LIVE auction! Audio and video streaming fully supported. Standard Version: $1999.00 License Renewal: $469/Yr. Premium Version: $2499.00 License Renewal: $99/Yr. Customized with your domain, etc. Delivered by digital download or SaaS (Software as a Service). Visual Penny Auction allows you to run your own robust and exciting Penny Auction! Now you can run your own auction site just like Ebay®! Visual Auction provides everything you need to manage and run an online auction business. 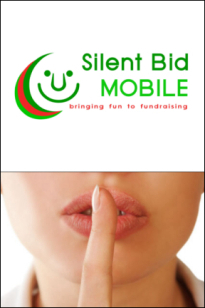 Bring your silent auctions up to date for your next fundraiser! This complete solution allows those attending your charity event to use their smartphone to bid on items and get real-time feedback. Customized with your domain, etc.